Langley, WA – Award-winning poet and journalist, Teresa Williams Irvin, announces the release of Seeds of Rebellion (ISBN 978-0-9799395-4-9), a young adult (YA) historical novel about the first French and Indian War fought in the Ohio Valley. Furious with his older brother, Matt, for letting him take the blame for an incident not his fault, fourteen-year-old Virginia native, Josh Bedford, steals Matt’s dream by hiding in his Uncle Harry’s wagon loaded with supplies for Fort Cumberland, where colonists and British redcoat regiments are assembling to fight the French. Josh conceals his true identity and finds work at the fort with legendary outdoorsman, Daniel Boone, and a young captain named George Washington. Josh also befriends a teenage Irish soldier and together they experience the British General Braddock’s botched campaign and its tragic consequences. Although he runs away from home an irresponsible youth, Josh returns a young man seasoned by the atrocities of war. Based on true accounts from the journals of redcoats who witnessed the event, Seeds of Rebellion is a lively and moving portrayal of one of the most significant battles in early American history. Author Teresa (Terry) Irvin creates a sympathetic and admirable character in Josh Bedford, a young man who demonstrates courage and true friendship as a he experiences the vagaries of war, including food and water shortages, illness, ambushes, and bloody battles. Josh meets members of the Mingo Native American tribe who helped the colonists and becomes an unwilling participant in the battle against the French when his uncle’s life is threatened. An outstanding story of courage and inspiration, Seeds of Rebellion has received praise from American historians and educators, including former Chief Justice, Sandra Day O’Connor, and Gary B. Nash, Ph.D., Director of the National Center for History. Seeds of Rebellion is an excellent choice for middle school and high school readers who are interested in learning more about the early days of the French and Indian War. Teresa Williams Irvin is a former journalist with The El Paso Herald Post. Born in El Paso, Texas, and raised in Douglas, Arizona, she holds a Bachelor of Science degree in Elementary Education from the University of Texas El Paso and is a graduate of the Institute of Children’s Literature. Her other books include Let the Tail Go with the Hide, a memoir based on her father’s Southwestern oral history. Terry enjoys bringing the past to life and has recently finished A Terrific Beginning, an autobiographical memoir due to be released in December, 2013. 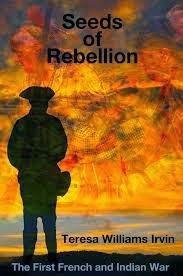 For more information on Teresa Williams Irvin or Seeds of Rebellion, please visit: www.TeresaIrvin.comor www.amazon.com. 1. What inspired you to write Seeds of Rebellion? An urgent note written by an ancestor to her brother fired my imagination: Marauders have burned the out buildings of Elizabeth’s plantation home; her husband is with Colonel Washington at Fort Cumberland; two of the children have measles; and she has just given birth and is too weak to get out of bed. 2. How would you describe the story’s main character, Josh Bedford? Jealous that his brother, Matt, is Pa’s favorite, Josh yearns for his father’s approval. But Josh has a history of being careless and irresponsible. Even though he stretches the truth on occasion, Josh demonstrates loyalty to his friends and exhibits great courage and resourcefulness in helping return his wounded Uncle Harry to safety after the bloody battle at Redstone Creek. 3. What age groups would be most interested in reading this book? Based on the response of older readers, it appears that Seeds of Rebellion appeals to all ages—however the target audience is middle school through high school. How better to learn history than with an engaging story anchored in fact? 4. What are the main themes of Seeds of Rebellion and how are they important for young adult readers? The main theme of Seeds of Rebellionis learning the hard way. After running away to Fort Cumberland, Josh discovers that his lies hinder his friendship with Oliver, an Irish fifer—and his carelessness with Daniel Boone’s horse threatens his very existence at the fort. Josh learns that, to gain approval, one must be responsible. The underlying theme is that military campaigns are bumbling, and there is no glory in war. 5. Friendship and loyalty seem to be important themes in Seeds of Rebellion. How does Josh’s view of his friends and family change during the course of the novel? Dismayed because he wasn’t truthful with Oliver, Josh uses his real name to sign the letter he promised to write if his friend was killed—vowing to himself never to lie again. Once he realizes that his hero, Uncle Harry, isn’t the man he thought he was, he has a greater understanding and appreciation for his father. And Josh and Matt finally really talk, smoothing the relationship between them. 6. In Seeds of Rebellion, Josh experiences the brutality of war first-hand. What important lessons about U.S. history can young readers draw from this novel? War is hell—to be avoided if possible. The freedom we all enjoy in this wonderful country didn’t just happen, but was won through courage, sacrifice, and human suffering—and it shouldn’t be taken for granted. 7. Are you working on another book and, if so, what can you tell us about it? I am 80 and have in my hopper a dozen finished stories for children. My autobiography, A Terrific Beginning, is in the process of being printed.